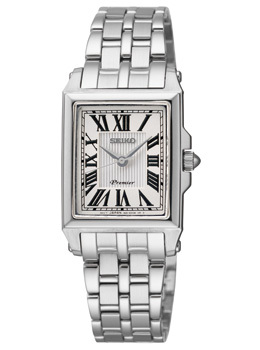 From the Seiko Premier line, this is a unique and elegant Ladies watch. A very nice gift for Mother’s Day. The case is partially satin finished stainless steel. The case is rectangular with Roman Numerals in black on a silver colored face. The sapphire crystal of this watch is highly scratch resistant.